WASHINGTON (CNN) -- After touring the wreckage Tuesday of two Metro transit trains that crashed the day before, killing nine, Washington Mayor Adrian Fenty said it was a sight that "no one should have to see." 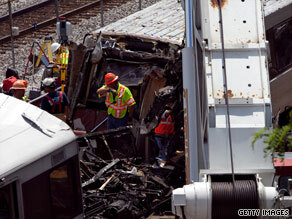 Investigators work Tuesday at the site of a Metro train crash in Washington. Officials said that all the wreckage has been cleared and that no other bodies have been found in what was the worst subway train accident in the history of the Washington Metropolitan Area Transit Authority. Three bodies discovered Tuesday were lodged behind the driver's compartment of the rear train, an official said at the scene. The driver of that train, who was among the dead, was Jeanice McMillan, 42, of Springfield, Virginia, Metro spokeswoman Lisa Farbstein said. McMillan had worked at Metro since January 2007. McMillan's aunt, Venice Foster, said her niece loved her job and "was just a joy to be around." Retired Maj. Gen. David F. Wherley Jr., former commanding general of the District of Columbia National Guard, and his wife, Ann, also were killed in the collision. Both were 62. The Metro's board approved a $250,000 hardship fund to assist the victims' families with funerals and other immediate expenses. According to Fenty, at least three bodies were trapped in a "very compressed area." It wasn't clear whether those were the bodies found behind the operator's station. "It just brings home what an awful tragedy this was," the mayor said. Both cars were on the same track, traveling in the same direction: southward from the Fort Totten Metrorail station to the Shady Grove station. The train in front had stopped behind another train undergoing service and awaited directions to move ahead. "We don't know at this point whether the operator could see the train in front of her in time to stop," said Deborah Hersman, who is leading the investigation for the National Transportation Safety Board. "I did have the opportunity to walk the track with our investigators. I can tell you it is a scene of real devastation," Hersman said. Jamie Jiao was sitting in the front car of the second train. He said he suffered injuries to his feet and back. "I see the train in front a split second before we crashed. That's all. You don't have time to react or do anything," he told CNN's Jeanne Meserve. He said that after impact, "You just hear really loud noises, as if there was an explosion. I could see things falling apart, tearing apart." A pole fell on top of him, but he was able to throw it off. The car broke open, and he crawled outside, where he waited for firefighters. He said he didn't notice whether the driver tried to brake before hitting the other train. Many of the passengers in his car were injured, he said. Hersman said there was a telescoping effect when the second car slammed into the first and landed atop it. "The first car [of the second train] overrode the rear car [of the front train], and much of the survivable space on that first car of the striking train was compromised," she said. One of the factors the NTSB will examine is the crash-worthiness of the cars. "The safety board has long been on record making recommendations about survivability when accidents do happen to make sure that operators and passengers are protected as much as possible," Hersman said, but those haven't been implemented. She didn't elaborate. The safety board has called since 2006 for the transit authority to modernize its fleet of transit cars. The agency has sought more safety features and higher technology, such as data boxes on each car that can provide valuable information in case of a crash, Hersman said. Citing the most recent federal data, she said the average age of the cars in the fleet was 19.3 years old. The Metro board is "aggressively seeking" to replace 300 1000-Series cars purchased between 1974 and 1978, said Jim Graham, chairman of Metro's board of directors. There should be nine data recorders aboard the first train, which will aid the investigation a great deal if they aren't damaged, Hersman said. The recorders provide data on such things as speed, braking and emergency applications. She said there were no recorders on the rear train. "We've recommended for years that WMATA either retrofit those cars or phase them out of the fleet. They have not been able to do that. And our recommendation was not addressed, so it has been closed in an unacceptable status," she said. "If there are changes we can make to those cars, we will do so," said John Catoe Jr., general manager of the transit authority. All trains were to operate in manual, instead of automatic, mode Tuesday, Catoe said at the briefing. He called the move "an extra safety precaution" until there is more information on the crash. The rear train was operating on "automatic" mode, which is routine during rush hour, and preliminary evidence shows that the driver may have employed the brakes, Hersman said. Hersman addressed reports that the trains may have been two months past due on brake inspections, saying, "We are very interested in looking at those records, and we're interested in looking at all of the records." She said cell phone and texting records would also be reviewed, which is standard. "We've investigated a number of accidents where there were distractions," she said, adding that it's unknown whether cell phone use was a factor in this crash. Nine safety board teams will examine aspects such as train operations and communications, signals, tracks, crash-worthiness of equipment, maintenance and survivability -- ease of fleeing the trains after the crash and other survivability factors, Hersman said. The transit authority gave Red Line riders several options for commuting Tuesday morning and was providing free shuttle buses to drive people around the accident scene. The only other time in Metrorail's 33-year history that there were customer fatalities was in January 1982, when three people died as a result of a derailment between the Federal Triangle and Smithsonian Metrorail stations. In 2004, two trains collided at the Woodley Park/Zoo-Adams Morgan Metrorail station. There were minor injuries.